Beauty Bundles and Fabulous Finds! Revision Fans have discovered how great Intellishade and Nectifirm is! 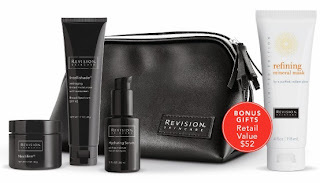 Limited Edition Revision Bags will give the best of Revision with a Travel bag, Nectifirm, Intellishade Original, Limited Edition Refining Mineral Mask and Hydrating Serum at an amazing price, with 10% off to shopspaViolet customers! SkinCeuticals takes the most popular products CE Ferulic and Phloretin CF and ads a bonus Retexturing Activator. Skincare like this will make any policeman rip up a ticket with such a glow! Want your Revision and SkinCeuticals products to maximize their benefit? Using a Clarisonic system allows 61% better penetration of products, and we have a holiday special to get your system now with a full size cleanser and one extra brush good for an extra 3 months! PCA Skin has a Bundle of joy for the season with the best of their line in a sampler pack to try out at your pleasure!